Privacy, location and amenities are all yours at Murphys Creekside. 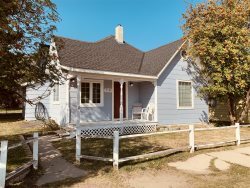 A spacious 3 bedroom home with a hot tub right on the banks of Rock Creek in Red Lodge, MT. Perfect for a family vacation, a girls weekend or basecamp for a mens trip. Privacy, location and amenities are all yours at Murphy’s Creekside. A spacious 3 bedroom home with a hot tub right on the banks of Rock Creek. Perfect for a family vacation, a girl’s weekend or base camp for a men’s hunting or fishing trip. There’s sleeping for 8. The master room has a queen bed and a private ¾ bath. There’s another queen bed in the second bedroom and 2 queen beds share the floor in the third bedroom. There’s a full size bath between the two bedrooms. Relax, unwind and enjoy your privacy with no neighbors in sight. Play games in the spacious living room huddled around the gas fireplace or head outside and fish right off your private patio. Heck, with a good cast, you can even fish from the hot tub. The creek is that close! When night falls and the stream rises, turn the bubbles off and hear the trickling of Rock Creek or the footsteps of wildlife crackling through the forest. Rest under a star lit sky and a moon so big and bright you swear you can reach out and touch it. We had a wonderful time! Great place and skiing was super. Saw bear tracks along the creek. Stars were brilliant. Hope to return next year. Beautiful place, love the lights on the deck outback with the creek.Very relaxing - clean and awesome . The lodge feels good - clean and simple - the creek out back is the focal point. Great location on Rock Creek, great house plan inside - private! Great Place! We loved the creek! The house was clean, beautiful and had wonderful amenities! Nearness to Yellowstone, scenery, weather, location, Beartooth Highway. Perfect stay. Murphys Creekside was very beautiful, clean and the perfect spot for dining in Red Lodge and easy access to a lot of activities, trails and more! Loved Regis Cafe and Piney Dell. Thanks for sharing your little part of paradise. Wonderful memories were made. On the creek, the sound of water. Hot tub. Division of living space. Local places we loved: Day trip to Yellowstone - Falls and Lake > wonderful. Beartooth pass drive - gorgeous - lake fishing up there. White water rafting - golf driving range - hikes - West Fork. Fun town day and night. Pig races. Great property. Clean. Many amenities included. Comfortable and enjoyable and we saw mother bear and cubs across the creek. It was awesome. Great family relaxation. Well be back. This was such a wonderful retreat. Beautiful location, quiet except the sound of the river and so close to town. The cabin was big and roomy, the deck was wonderful. We would definitely love to come back. Local Places You Loved:Animal Sanctuary was awesome. We frequent VRBO and others yearly or more. Murphys Creekside cabin is so beautiful and comfortable inside and out. The rooms are large and close to creek. The furnishing are so nice and comfortable. Wish we could stay longer. Local Places You Loved: Fun shopping in town. Ate at the Pollard - delicious and different. Visited Wild Bill Lake - serene. Saw a double rainbow. Riding bicycles down Beartooth Pass - cool! Rented ATVs up Hell Roaring Trail and Glacier Lake. Hiking Stillwater - beautiful!! Relaxing in hot tub on Rock Creek. Eating at Bogarts and Pollard. This house has an awesome location - scenic, close to RL and ski area. Great place to relax and enjoy time with family and friends. The windows looking out to Rock Creek are perfect for all seasons!